Roughly 200 people pass by daily to watch her work around the downtown Hayward area by City Hall and B Street. They are seemingly mesmerized as her brush strokes create landscapes, cars and city landmarks onto the city’s dull, monotonous utility boxes as part of a graffiti abatement project. 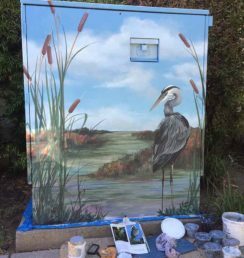 Artist Jean Bidwell, 53, a resident of Hayward since 1999, was hired this summer by the city of Hayward as a utility box painter for the city. Art has always been part of Bidwell’s life. In elementary school she used crayons and paper to create her pictures and later as a high school wallflower she was asked to do murals around her school. Bidwell graduated from Mount Saint Mary’s College, a catholic women’s college in Santa Monica with a bachelor’s degree in fine arts. During her high school years, she created full-scale murals for Camarillo State Mental Institution in southern California. “It was fascinating since you’re working with the mentally ill. You’d go in every day that you could on weekends, scrape all the food off the wall that they’d thrown at it — these are very troubled people, clean it down with water and start painting again. 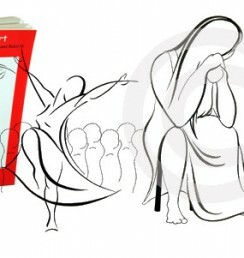 I wonder now if I didn’t develop an intense compassion for the mentally ill then,” said Bidwell. Born in Oxnard, Calif. in a small farming community in southern California, Bidwell said she loved being outdoors. “My father was a farming forman and so we traveled a lot from property to property to get a farm going and move on to the next one. We eventually settled back in Oxnard again,” said Bidwell adding that she was the youngest of five. 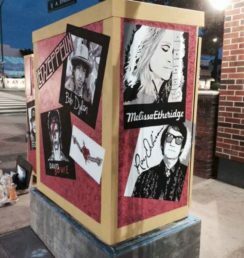 Hayward gave Bidwell the opportunity to paint utility boxes through the Hayward Mural Program, and after a trial period of painting boxes around the city it was the residents and other onlookers who requested that she continue. But she says it’s more than just putting a picture on a box. The job is also about connecting with people on the street. 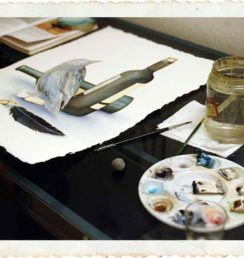 At times the onlookers would have ideas for Bidwell’s paintings and she would put some of their ideas into the finished product. Each artist submits concepts to the city committee for consideration, who then vote on what is most appropriate for the location/space. 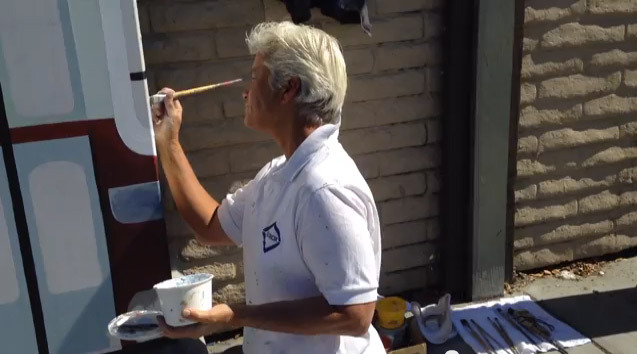 When Bidwell was told she would be painting the boxes along Mission Boulevard she chose to paint classic cars to bring back the old history of the street. She mentions that one 70-year-old man came to watch her paint and also wanted her to see his pictures. “We spent an hour just going over his drawings, he had two binders full, all pointillism (dots) and they were beautiful,” said Bidwell. Before painting utility boxes, Bidwell was a kitchen designer and sign maker for the Home Depot in Pleasanton for 12 years. “My manager came out to look at one of the murals I was working on and he said, ‘you know, I don’t want to lose you, but this is wrong for you to not be doing this all the time.’ He actually talked me into quitting,” said Bidwell. A future project for Bidwell includes a mural at Industrial Parkway that is going to be 8,000 square feet and will take approximately one year to complete. This entry was published in The Pioneer Online on Thursday, October 10th, 2013 at 8:33 am.